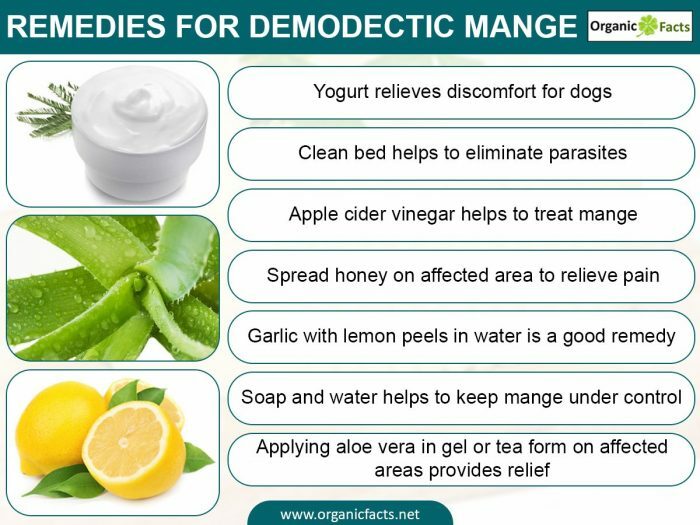 The useful home remedies for demodectic mange include the use of hydrogen peroxide, borax, yogurt, honey, apple cider vinegar, olive oil, fish oil, lemon peels, aloe vera, neem oil, soap and water, and certain preventative practices, such as regularly cleaning your dog’s bedding. Due to the natural antiseptic and antiparasitic nature of aloe vera, it makes for an ideal home remedy for mange. Spread aloe vera, either in gel or tea form on the animal’s affected areas twice a day and start seeing results, as well as a much happier dog, within a few days! This may seem like a strange combination, but if you soak 6-10 cloves of garlic with lemon peels in water overnight, the resulting liquid will be infused with a wide variety of beneficial organic compounds to stimulate healing and neutralize the parasites on your dog. It might smell a bit strange, but it will get the job done. As with hundreds of other common medical conditions, the perennial cure-all of apple cider vinegar is also good for treating mange. Simply add a small amount (a few tablespoons) of apple cider vinegar to your dog’s normal meal and you’ll be amazed how quickly recovery begins. Spreading organic honey on the affected area of your dog’s fur is effective for two reasons; you effectively suffocate the parasites that are reproducing so rapidly, while also soothing the inflamed areas and stimulating more rapid healing, due to the rich stores of organic compounds found in honey. One of the unfortunate side effects of mange is a crusty or discolored discharge from the ears of the dog, which is also itchy and uncomfortable. The acidophilus bacteria found in yogurt can help to eliminate this symptom and relieve the discomfort for your dog. Applying olive oil or other cooking oils to the affected areas of the dogs’ skin can help to alleviate the inflammation and the waxy build-up on the skin due to mange, while also eliminating the parasites from the area. The old solutions are often the best, and the alkaline nature of most common soaps will keep the mange under control and reduce inflammation, while also killing the parasites responsible for the condition. This is the most common home remedy for treating mange, but because dogs will become ill if they lick this mixture, despite its efficiency, many people choose an even more natural route. If you do use this hydrogen peroxide and borax solution to wash your dog (approx. once a week), don’t wipe your dog dry, as that will eliminate what you’ve just tried to do! Although this isn’t a direct remedy for the dog, regularly cleaning your dog’s bedding, particularly after using these home remedies to eliminate the parasites, is highly recommended. If your dog has millions of more mites in its bedding, then all of these topical solutions will be useless, as the mites will simply return. Word of Caution: Although these home remedies are highly effective, remember that this could develop into a life-threatening situation for your dog, especially if it becomes complicated by secondary infections. See a veterinarian, if possible, so that he or she can tell you whether home remedies will suffice for a healthy recovery. Average rating 4.1 out of 5.0 based on 273 user(s).